Is it time for a backyard makeover? The weather has finally turned to spring and we’re just a few weeks from the official start of summer. This is the time of year backyards were made for. What’s your outdoor preference? Reading on a hammock? Grilling up steaks for dinner? Or just having a few friends over for a relaxing drink after work. You’ll have a much better time with anyone of those activities if your backyard is in good shape. You really don’t have to go for a complete overhaul to spruce things up. There are plenty of easy and affordable fixes you can incorporate right away. For instance, if you’ve got some brown patches of grass that won’t turn green no matter what you do then why not hide them? You can use potted flowers to do the trick. Hanging planters can be utilized on the side of a garage or tool shed to cover up weather worn wood. If you don’t want to wait for grass seed to grow, invest in a few rolls of sod. Just make sure you keep up the watering until it takes hold. Bricks or flat stones make for a nice patch and can be put down without too much digging. You can also turn a flowerbed into a rock garden by adding colorful pebbles or stones. It might be that all your yard really needs is a good cleaning. Much like your house should go through spring-cleaning, you should give your yards the same treatment. After raking, digging, trimming and pruning you find yourself with piles of yard waste to toss out. In extreme backyard cleanups you could find yourself busting up an old patio or driveway. Now you’ll have a nice rubble pile of concrete. How can you get rid of that? You can’t use your weekly garbage pickup because there is a weight limit. Your best option would be to hire Junk King Raleigh ASAP. With Junk King on the job, you’ll have your yard cleared up in no time. The Junk King Raleigh crew assigned to your removal gig will come equipped with the right tools for the job including wheelbarrows, bins, shovels, brooms and rakes. Anything you’re tossing out will go on the back of the Junk King truck. This means you won’t have to get the back of the family car dirty! Best of all is that Junk King doesn’t have to stop at yard work. They can also clear out the piles of clutter you have stacked at various locations around your home. This means garages, basements and attics. Outside or inside, let Junk King Raleigh help you take out the trash! 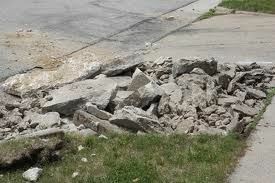 This entry was posted in Raleigh Concrete Disposal and tagged Raleigh Concrete Disposal and Recycling, Raleigh Construction Waste on May 15, 2013 by Britt Holcomb. Last updated August 1, 2017 .